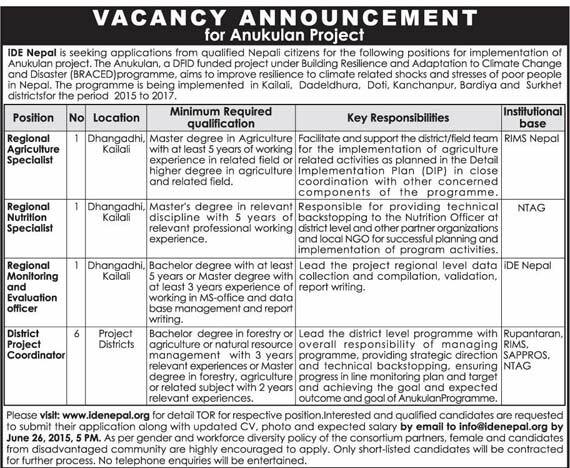 IDE Nepal is seeking applications from qualified Nepali citizens for the following positions for implementation of Anukulan project. The Anukulan, a DFID funded project under Building Resilience and Adaptation to Climate Change and Disaster (BRACED) programme, aims to improve resilience to climate related shocks and stresses of poor people in Nepal. The programme is being implemented in Kailali, Dadeldhura, Doti, Kanchanpur, Bardiya and Surkhet districtsfor the period 2015 to 2017.